- Enriched with the ancient secrets of Ayurveda, this magnificent homemade face scrub will help you to rediscover the secrets of beautiful skin. A naturally gentle, soap-free face scrub pack full of nutrients will gently unclog your skin pores and wash away dead skin cells, stimulating the growth of fresh cells, breathing new life into your skin. - This Ayurvedic Facial Scrub acts as a skin polisher, giving you the effect of a spa facial, right in the comfort of your home. Containing Oats, Almonds & Organic Wheat Germ Oil, act as natural skin cleansers, revitalising your skin from external impurities, with no pore-clogging residue. Turmeric and honey reveal a softer skin. Lemon extracts act as skin whitening agents with anti-inflammatory, skin-soothing properties giving you that drop dead, velvety soft skin that you have always dreamt of! * Organic Oats (Avena Sativa Kernel Extract) & Crushed Almond (Prunus Amygdalus Dulcis Fruit Extract ): This mixture forms an excellent source of the best natural (organic) exfoliants. Cleanses and exfoliates the outer layers of the skin by removing dirt and dead cells. Helps stimulate and circulate lymph fluids which aid in the elimination of toxins. Oatmeal is rich in vitamin E and well known for its anti-inflammatory, anti-itch, skin-soothing properties. This coarse mixture provides an excellent source of natural exfoliation, especially on extremely dry and irritated skin. * Turmeric (Curcuma Longa Root Powder): Organic plant products like turmeric have been formulated to heal and prevent dry skin, treat skin conditions such as eczema and acne. Turmeric reduces skin infections, giving the skin a natural glow and helping to lighten scars caused by acne. * Neem Oil (Azadirachta Indica): Enriched with an abundant resource of healing properties, Neem oil works wonders during the exfoliation process. It uplifts and rejuvenates your skin by providing overall restoration. It helps soothe damaged or irritated skin and even provides relief to skin inflammations. * Honey: A key ingredient in the Ayurvedic Scrub, Honey is power packed with natural antioxidant and anti-microbial properties. It acts as a shield to the skin, protecting it from damage from harsh UV rays and sun’s rays and supports the skin’s ability to rejuvenate and refresh depleted skin. 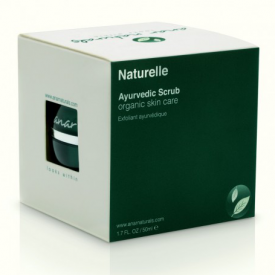 Its’ restorative properties boosts the skin’s healing process and gives you silky smooth skin. * Lemon Oil (Citrus Medica Limonum): Contains natural bleaching properties which work towards enhancing your complexion and removing marks and pigmentations. Being a natural cleanser, lemon oil is the perfect blend of an exfolliant and skin polisher. Further, owing to its acidic nature, known to protect your skin against bacterial growth which results in acne and pimples. It also removed the excess oil in your skin giving you a fresh and clean feel. * Grapefruit Seed Oil (Citrus Paradisi Seed Oil): Contains antioxidants in the oil which are more powerful than Vitamin C and Vitamin E. It helps prevent skin pores from clogging, which result in acne & breakouts. Surprisingly, this oil is highly effective on oily skin as well. It provides the right balance for this scrub, as it not just removes existing acne but helps protect the skin from future breakouts as well. * Koren Ginseng Extract (Ginseng Extract Panax): When applied to your skin forms an elegant oil film on the skin that will tighten and smooth the affected skin immediately. We recommend use two to three times weekly. More regular use of the scrub will help keep your skin clean, improve blood circulation and give your face a full and fresh look. (For acne-prone skin, daily use is advisable). For men - after shaving. Ideal to be used after a long day, at the night before sleeping. It cleanses your skin’s pores, allowing your skin to breathe through the night. Wash your face with warm water. Take a small quantity of the scrub in your palms and rub your hands together. Gently apply to scrub on your face and massage for a few minutes in upward circular motions. Gently wash off with warm water and pat dry. - Skin Type: Normal, Irritated & Sensitive skin, Acne, Removing Dirt & Oil, Razor Burns, Fine Lines, Aging spots & Wrinkles. Aqua, Natural Wheatgerm Oil (Triticum Vulgare Germ Oil), Vegetable Glycerin, Vegetable Wax - Sunflower (Helianthus Annuus Seed Wax), Honey, Chick Pea Flour, Organic Oats (Avena Sativa Kernel Extract), Crushed Almond (Prunus Amygdalus Dulcis Fruit Extract ), Grapefruit Seed Oil (Citrus Paradisi Seed Oil), Neem Oil (Azadirachta Indica), Ginseng Extract (Ginseng Extract Panax), Lemon Oil (Citrus Medica Limonum), Turmeric (Curcuma Longa Root Powder). 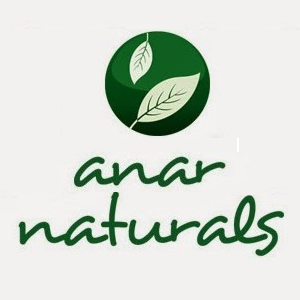 I have used a number of Anar Naturals products and have yet to b disappointed. This is an effective, gentle , non drying face scrub. A nice gentle natural scrub from an ethical company. 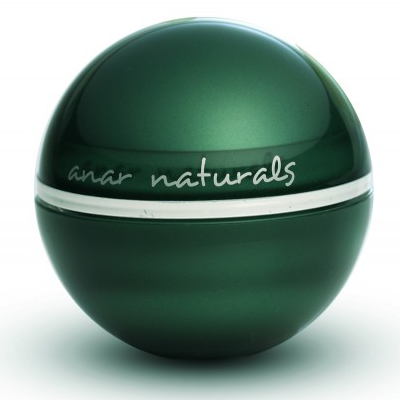 "I have used a number of Anar Naturals products and have yet to b disappointed. This is an effective, gentle , non drying face scrub...."